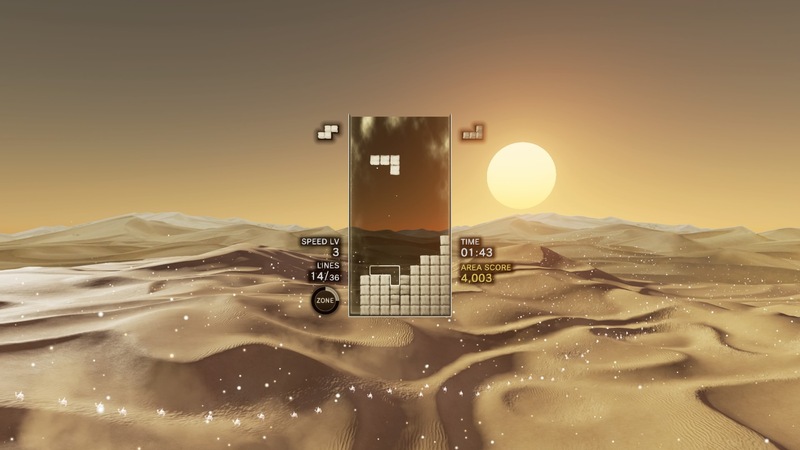 Tetris Effect is quite possibly the greatest innovation the series has seen in its over thirty-year lifespan. However, it was also designed as a love letter to one of the most enduring games of all time. As part of the first “Weekend Ritual,” which is a limited-time event that runs over the weekend, players were able to unlock a skin that paid tribute to quite possibly the most famous version of Tetris there is. The skin is known as “1989,” and as you can probably guess, it is a tribute to Tetris on the Game Boy. Its color scheme is that distinct shade of green green, and the background features imagery from Tetris’ handheld incarnation. But the best part may be the music, which is already a big part of Tetris Effect. The level features the iconic theme anyone who’s used a Game Boy will recognize. It may not be the dreamy tunes that normally plays during Tetris Effect, but we wouldn’t have it any other way. The Game Boy incarnation is arguably what helped make Tetris the phenomenon it is, so it’s lovely to see it get such a great tribute. Unfortunately, the level is unavailable to many at this time, but it can be unlocked by reaching level 50. While this is an awesome tribute, Tetris Effect is still a great game in general. In our review, we called it an “instantly timeless puzzle game.” Hopefully, we see even more Tetris tributes from this game in the future. Tetris Effect is available now on the PlayStation4.